Between 2001 and 2011 the Emilia-Romagna region lost 22.6% of workers in the secondary (industrial) sector, with this percentage being even higher in the province of Bologna. Meanwhile, the tertiary sector has become more and more important, following a trend that is well-known throughout the industrialized western countries, but is felt particularly severely here. Once a city based largely on manufacturing activities, Bologna has since transformed into a city of commerce and services. But while the number of workers in the tertiary sector grew by 15.4%, the number of businesses decreased by about 7%, and this data only takes us up to 2011, when the economic crisis really began to hit small businesses. Contrary to the New York Times’ portrayal of the city, Bologna is less and less a city of small independent shops and restaurants. On the contrary, a growing part of its economic activity is in the hands of large companies. Before the crisis, the growth of the tertiary sector was mostly supported by the average wealth of the population (the Emilia-Romagna region is still the fourth richest in Italy as of 2014) and by the huge student presence, accounting for over 70,000 people in 2009, 63% of them coming from outside Emilia-Romagna. But during the last 10 years the unemployment rate has more than doubled and universities across Italy have lost almost a quarter of their student enrollment. The city has had to change its paradigm. Italy doesn’t care for students. The budget for students’ economic support is constantly cut, and only 8% of students receive it. Italian universities have the third highest fees in Europe, a cost that more and more families are unable to afford, particularly as the job market offers little opportunity for graduates. Only 17% of Italian workers are employed in a highly specialized job, a figure that has remained more or less the same since the beginning of the crisis, and represents less than half the equivalent amount in the UK. During the good years, students were a great way to spend families’ money, through university fees, rents, general expenses. Now that so many families are broke (having lost more than 50% of their savings), the number of students simply had to be reduced. In addition, and to the great satisfaction of the State, the students are quieter than ever. The universities have lost much of their political potential during the past few years, mostly due to the fact that there are fewer students, and that reduction has obviously affected the working class more than the rich. Nevertheless, they remain a possible source of rebellion. 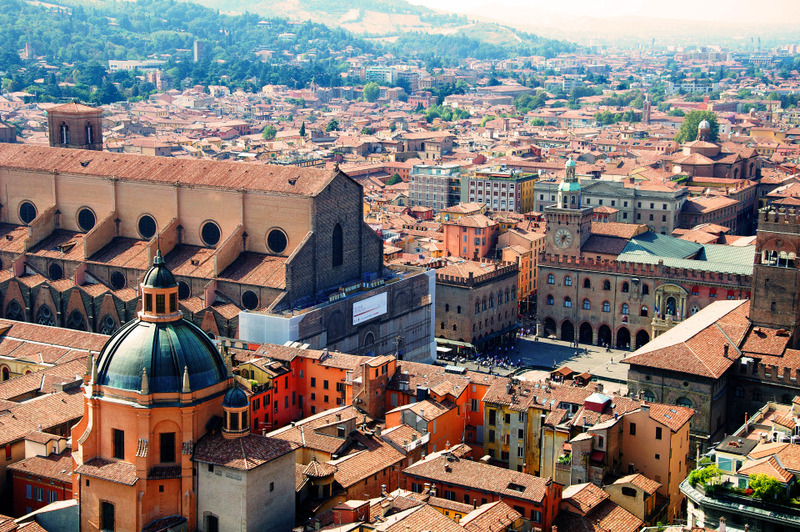 In Bologna, most of the university departments are in the city centre or just nearby, located in beautiful ancient buildings with huge historical and economic value. For example, the magnificent Palazzo Malvezzi Campeggi and the baroque Palazzo Marescotti Brazzetti, both built in XVIcentury. Both of these buildings are now for sale, along with several others. The price? It hasn’t been officially fixed yet, but it will certainly be lower than it should be, as always happens with public goods. The students will be moved to a newly-built campus outside the city centre, while the majestic palaces will go to banks and real estate funds, to be transformed into luxury hotels, offices and apartments. It’s a textbook case of gentrification waiting to happen. Meanwhile, the city government and local businessmen have bet on food. Bologna is situated in just the right place to attract the new wine and food tourism, such as was celebrated by Milan’s gargantuan Expo – which cost an estimated 14 billion euros of public money, managed by a corrupt elite and their criminal friends. And to make it clear that Expo is the model for future development in the city, Bologna’s local government has decided to build a huge “food park”, named F.I.CO. They have also assigned its management – without any competition – to Oscar Farinetti, the owner of Eataly and a personal friend of PM Matteo Renzi (as well as, quite naturally, a major contributor to Renzi’s campaign to become Secretary of the Partito Democratico). Farinetti received the contract to manage 8000 square metres of restaurants inside Milan’s Expo in just the same way. According to the announcements, F.I.CO. was supposed to open just after Expo’s closure, in October, but the construction works are still behind schedule. F.I.CO, the city government claims, will attract 10 million tourists a year, and will become Italy’s most visited “monument” (around twice the number of visitors as the Colosseum). Farinetti goes even further, claiming that F.I.CO. could even outmatch EuroDisney in Paris, which counts 12 million annual visitors. The presence of two million school students a year would be guaranteed by an agreement made between Eataly and Renzi’s government, to make sure that schools from all over Italy bring their students to F.I.CO. According to the journalist Wolf Bukowski (who wrote a book about Farinetti and Eataly), these figures have no basis in reality, but were simply used as a marketing tool to justify the takeover of F.I.CO.‘s planned location – a wholesale fruit and vegetable market worth 55 million Euros, owned by the municipality, which would be allocated to Farinetti, for free. The profits then flowing from F.I.CO. would be shared between Farinetti and the many cooperatives involved in the project, such as Coop and Granarolo. And since F.I.CO. will be located just a few kilometres away from the city centre, it will not make the city richer, but indeed poorer, by diverting tourist cash away from local shops. This will inevitably cause a new wave of unemployment, opponents of the project say, and the jobs created by F.I.CO. will be low income, precarious jobs, with little in the way of workers’ rights, as always happens in Eataly’s shops. Farinetti himself declared that 8 euro gross (or about 800 Euro a month, for a full time job) is the right hourly wage. In response to workers protesting against him, he has said that he allows them to eat for free at work, so there’s no reason to complain about not having enough to live on. Clearly this marks a further erosion of the social safety net, by forcing workers to accept worse conditions, and Farinetti is keen to be a major protagonist in these disturbing developments. As always, gentrification comes at a high price for common people. The rents in the city are simply too expensive for a growing part of its population hit severely by years of crisis. This has led to a wave of housing occupations, involving several hundred people. The most important one was the occupation of the Ex-Telecom building, right in front of the municipality offices, that was in the end lived in by more than 300 people, 105 of them minors. Together with some other occupations, the Ex-Telecom building was evicted in October, in an incredibly violent operation involving more than 40 police trucks and about 200 police officers. The families were thrown out right under the eyes of the Councillor for Welfare Amelia Frascaroli, who watched from her office window. There was nothing the city council could do about the eviction, Frascaroli said. And while this is very likely not true, it is true that the local government didn’t want to be involved in such a large and high profile eviction, with all the bad publicity and difficulty of suddenly having to find places for so many people to sleep. It was conducted by the police, politically, in a coup-like manner. A couple of days before, the political police had even targeted the same Councillor because she had dared to say that the housing occupations “create social value”. The Ex-Telecom occupation was a thorn in the side of the local administration. It was too big to be ignored or evicted in silence, and at last it forced the Mayor, Virginio Merola (Partito Democratico) to negotiate some basic concessions, like allowing the building to have a water mains connection during one of the hottest summers ever. This “mild” attitude was in contrast with Renzi’s government’s decision to harden the laws against housing occupations through the Lupi Decree. And with local elections coming in Spring, the Partito Democratico couldn’t afford this kind of discord. Bologna has not been “the Red City” for decades, but the local Partito Democratico is not completely toeing Renzi’s party line, either. The leadership of the party has nothing to do with the old communist tradition any more, but a certain open-mindedness towards a few political expressions of the left still survive. For example, the support for LGBT rights and the tolerance of the Disobbedienti, an antagonist group with strong links to the SEL party, a centre-left party allied with the Partito Democratico on Bologna’s city council. During the past months, one of the most important LGBT groups in the city, Atlantide, was evicted and one of the local Disobbedienti leaders, Gianmarco De Pieri, was put under house arrest for his involvement in clashes that happened during an anti-fascist demonstration, together with four other militants. De Pieri is just one of the many militants in the city who have been hit by strongly repressive measures in the last two years, like house arrests and prohibition of residency orders, but his case was able to reach the national media and receive solidarity from many members of the institutional left. All these police actions are directed towards one clear objective: to cut all the remaining connections between Bologna’s Partito Democratico and the left, and to transform the Party according to Matteo Renzi’s vision. Renzi is trying to transform Bologna into a new, bigger version of Florence. A city for tourists, banks and businessmen, emptied of its inhabitants and governed by the new Partito Democratico. A quiet, beautiful amusement park, where money can flow and hands can be shaken, in peace.